Oost Eclo(o) is on the map since the middle of the 14th Century. "Oost" means east and ecloo is the oak ("ec" or "eik") woods (lo). The creation of this town is intimitely linked with the Cistercian abbey (for nuns) situated on its territory. This abbey was probably founded here in the first quarter of the 13th Century. The abbey can claim responsibility for a considerable part of the work of developing the surrounding "waste" land. At the time of the Ancien Regime Oosteeklo belonged to the Boekhoute Corporation, one of the Four Corporations. During the religious troubles of the 16th Century many inhabitants adopted the new faith. The abbey was largely destroyed and the nuns fled to Ghent never to return. In 1585 they built a new convent in Ghent on the corner of the Oude Houtlei (Old Wood Avenue) and the Posteernestraat. On the site of the old abbey and of course with the stone of the ruins four farms were built. The house of the "Schoonlucht" (Clean Air) Farm was one of those buildings. From 1617 to 1619 the parish priest of Oosteeklo was the well known Antonius Sanderus. Antoine Sanders was born in Antwerp on 15 September 1586. His parents were from Ghent and had fled to Antwerp because of the religious troubles. His magnum opus, the Flandria Illustrata is a splendid 750 page encyclopaedia of the Flanders of his day written in Latin with, as its titel suggests, lots of illustrations. He died on 16 January 1664 in the Benedictine Abbey of Afflighem. A number of old farms are to be found here and there on the territory of Oosteeklo. There is the "Bijsterveld" Farm, a walled in farm of 113 hectares. In the 15th Century it belonged to Bernard Zoete from Laken. Laken (or Laeken) is now part of Brussels, the capital of Belgium. The "Goed in den Oosthoek" (Estate in the Eastcorner) was known already in 1480. Its size was about 50 acres and it belonged to John Van Reyschoot. The parish was first part of the bishopric of Utrecht. (This town is now in the Netherlands). But in 1264 Oosteeklo was incorporated in the bishopric of Doornik (Tournai). 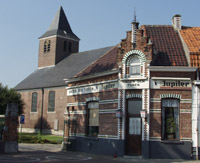 The Holy Cross and Notre Dame Church was built between 1781 and 1784 by architect Johannes Stockman, the burgomaster of Lembeke. 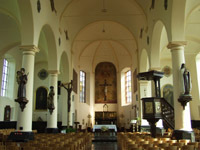 The Lembeke church served as the model. It has three naves under a saddle roof. Above the western facade there is a square tower with a short spire. 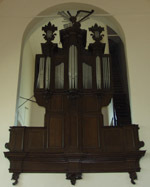 Inside the church you can admire a beautiful Van Peteghem organ dating from the second half of the 18th Century. The Way of the Cross is by Alois De Beule, a well known artist from Ghent. The main altar was donated by Nikolaas De Roover, who was born here and who was the last monk of the Dunes Abbey of Bruges. According to Oosteeklo.com, a mighty fine website, there were on 1 January 2011 in Oosteeklo 2704 inhabitants. The source for most of the above is the excellent "Streekgids Meetjesland", 1998, pp. 33-34. See also: Our Sources. For a selection of Oosteeklo pictures from the Romano Tondat Meetjesland Picture Collection please click here.